The government set out their definition of British values in the 2011 Prevent Strategy. These were reinforced in September 2014. These new regulations will sit alongside the requirements of the Equalities Act, which also applies to all school. Our “Student Voice” teaching and learning group plays a strong role in our school. They are elected by their class peers and are involved in making the College a better place to learn. 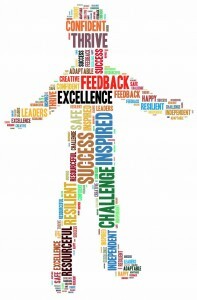 Students have a great amount of input in to what and how they learn, which promotes Student Voice. 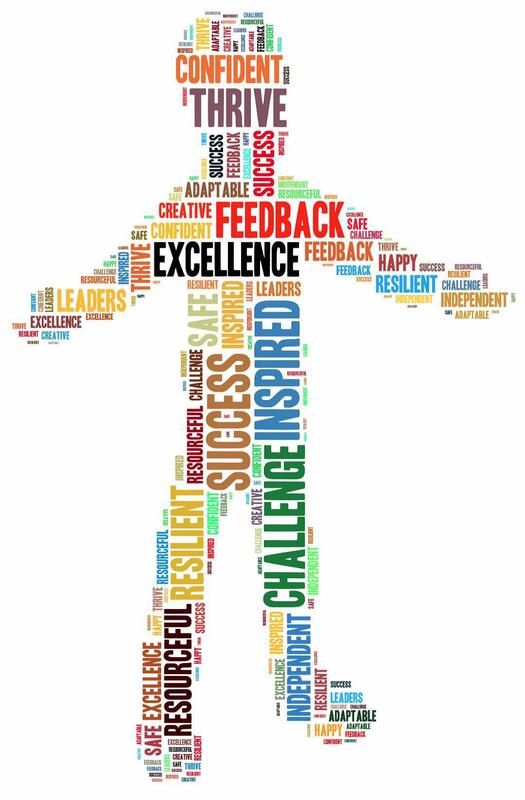 For example, the planning of the College’s Personal Development Programme is significantly influenced by pupil input through their responses to the confidential: “Growing Up in North Yorkshire Survey”. Student questionnaires and interviews are also conducted throughout the year. We know that the active participation of our students will sow the seeds for a more sophisticated understanding of democracy in the future. Our students will encounter rules and laws throughout their entire lives. We want our students to understand that whether these laws govern the class, the school, the neighbourhood or the country, they are set for good reasons and must be adhered to. This understanding of the importance of rules will be consistently reinforced through assemblies and our curriculum. The involvement of our students in the creation of the school rules helps them to understand the reasons behind the rules and the consequences if they are broken. Through philosophical enquiry in our RE and Personal Development lessons, we allow opportunity to debate and discuss the reasons for laws so that students can recognise the importance of these for their own protection. Throughout the year we welcome visits from members of the wider community including police, war veterans, the fire brigade etc. We believe that clear explanations and contextualising learning emphasise the importance of the rule of law for our students. We invest a great deal of time in creating a positive culture in our school, so that students are in a safe environment where choice and freedom are encouraged. In lessons, students often have a choice of learning tasks. We encourage students to choose a task which will challenge them, giving them more freedom to determine their own learning. We offer a range of clubs which students have the freedom to choose from, based on their interests. Through our e-Safety, RE and Personal Development sessions, we educate children on their rights and personal freedoms as well as supporting them in recognising how to exercise these freedoms safely. At Settle College we believe that valuing choice and freedom in daily school life will foster values of individual liberty as the students embark upon their adult lives. Mutual respect is at the core of our school life. Students learn to treat each other and staff with respect. This is evident when walking around the College and in the classrooms. We actively promote “Achievement through Partnership” and this partnership is seen throughout the various relationships between students and staff. At Settle College we offer a culturally rich and diverse curriculum in which all major religions are studied and respected. We strongly believe that tolerance is gained through knowledge and understanding. Through both our curriculum and the routines of our daily school life we strive to demonstrate tolerance, helping students to become knowledgeable and understanding citizens who can build a better society for the future. At Settle College we like to promote the values which ensure our students leave here as respectable and purposeful citizens. A way in which we are promoting this is through the issue of ‘Settle College Values’ badges. Staff can nominate a student for a ‘Settle College Values’ badge for demonstrating the values both in and outside of lessons, and ‘above the norm’. 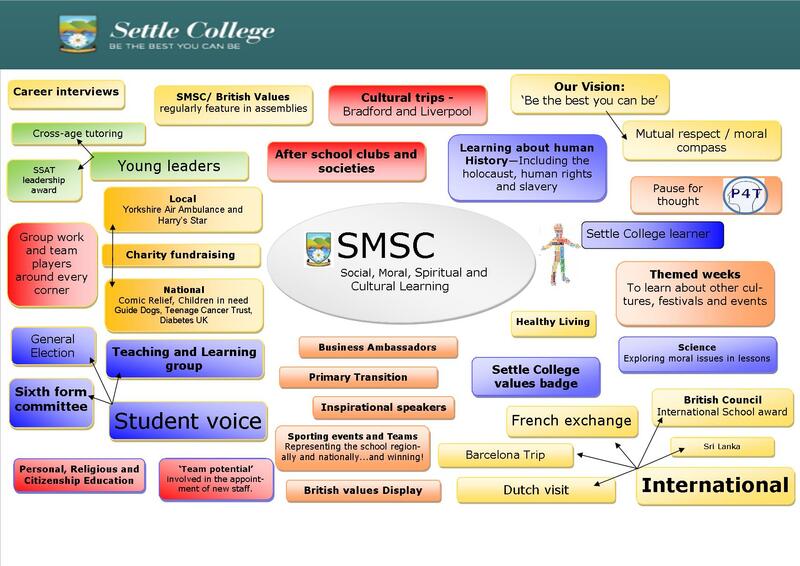 The diagram below illustrates how social, moral, spiritual and cultural learning is incorporated into life at Settle College.